An indoor grow is being broken up in Sunny Brae right now. To reiterate, the FBI insists that this operation is targeting a single individual or group of individuals, and is not an all-purpose sweep of grow houses. 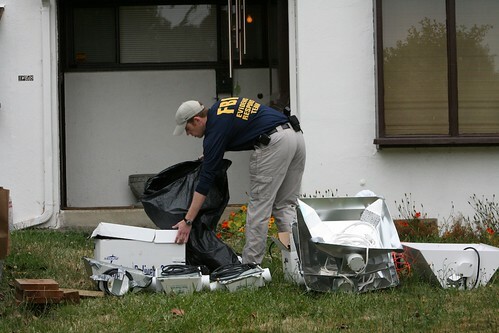 UPDATE, 9:31 a.m. : Bob Doran is at 1658 Virginia Way, Arcata, where three federal agents in FBI windbreakers have pulled grow lights and sundry devices out of a home there. They're not talking. Doran reports that they're paying particular attention to a car in the driveway bearing Oregon plates. They seem to be hauling numerous paper shopping bags out of the car.